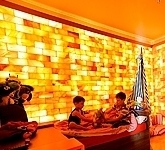 Cube sauna features contemporary design with giant glass walls, minimalist wall finishing and unique benches. 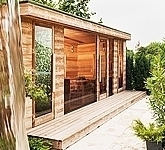 Being very popular in Europe, Cube sauna cabin is available in both indoor and outdoor sauna design. 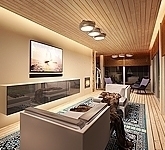 It is more than spectacular how the interior of the Cube sauna is filled up with natural light. While the Canadian Red Cedar blocks give the sauna house a rather minimalist look, the glass surfaces practically embed the sauna space in its environment. 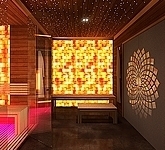 Hardened glass surfaces allows the sauna to shine in its glory in the evening hours as the LED colour therapy sheds some beautiful light on the interior and the direct surroundings of the sauna room. The Cube sauna is equipped with a glass panel as a divider in the minimalist interior while the special combined sauna still remains in focus and centred. 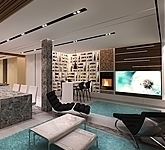 The Cube sauna either ergonomic or minimalist benches to further enhance the feeling of luxury and comfort. 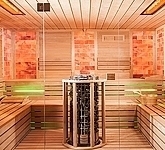 What makes Cube sauna so popular is the versatility of its application. 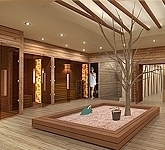 When it comes to functionality, the user has the convenience to choose from the benefits of infra sauna, finnish sauna, steam sauna, bio sauna, Himalayan salt therapy and aroma cabin. 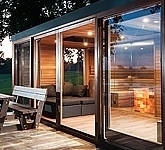 The Cube sauna is also available in outdoor version equipped with heat insulating glazing and countersunk roof-mounted infra heating panels to enhance the feeling of comfort. 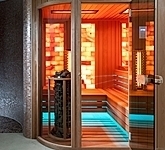 Cube sauna lets you experience how health, comfort and harmony can be combined in the sense of luxury. 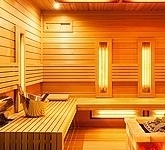 Join the exclusive club of sauna owners who enjoy this luxury every day in their homes. Exclusive quality and precise construction at the best available price directly from the sauna manufacturer.